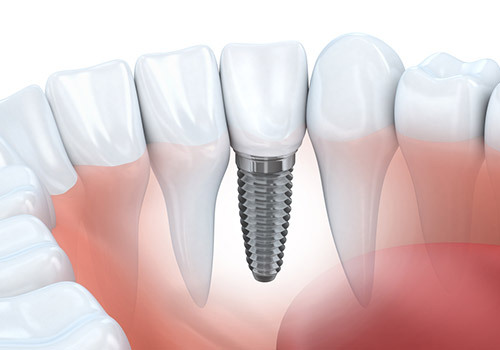 Dental implants are easily the greatest innovation in the history of dentistry. Using the latest dentistry techniques and technologies, we help patients restore the functionality, appearance and confidence they experienced prior to losing or damaging their teeth. Unlike dentures, implants offer more comfort and freedom. While they have been used for decades, today's implants are stronger and more natural than ever, from the proven traditional dental implants to immediately loaded implants, or "Teeth In A Day." AZPerio's specialists use only the highest quality dental implants with a proven evidence base to ensure superior outcomes. Ceramic implants (also referred to as "zirconia implants") are a non-metal alternative to titanium implants which might be an option for specific patient types and specific cases. In coordination with your dentist, our board-certified periodontists can provide personalized treatment recommendations and supplemental procedures, such as bone grafting, sinus lifts and ridge augmentation. AZ Perio provides dental implant services in Scottsdale, Phoenix, Gilbert, Ahwatukee, Cottonwood and Sedona. Book an appointment, today. Patients are never without their teeth – teeth are installed the same day as extractions. The treatment eliminates the need to wear temporary restorations, flippers or dentures. Patients report easier healing, as teeth are implant-supported and not resting on the gums. The treatment can be completed on a single tooth or multiple teeth. Our periodontists will use a 3D scan to help you determine whether traditional implants or “Teeth In A Day” are the best option for you. A revolutionary development in implant dentistry has helped thousands of people missing all their teeth, or whose remaining teeth cannot be saved, by providing an affordable alternative to traditional dentures and dental implant treatment. This procedure, named the All-on-4® Treatment Concept, provides patients with a full arch of replacement teeth, supported by just four strategically placed implants, usually without the need for bone grafting. As shown in the illustration, four implants are used to replace all the upper teeth by tilting two of the implants to avoid the sinuses toward the back of the mouth. These tilted implants are longer than the other implants, providing strong support with only four implants, as opposed to placing additional implants to achieve that level of stability. Likewise, just four implants are used to replace all the lower teeth by tilting two of the implants to avoid the nerve that runs through the back of the lower jaw. Following a consultation with a dental CT scan and diagnostic work up to determine if a patient is a candidate for the procedure, the replacement teeth are fabricated using digital planning software. This allows AZPerio’s specialist to have the replacement teeth available to be placed on the same day the implants are placed. As with all dental implants, the All-on-4® treatment concept is placed during an outpatient procedure in an AZPerio office. Most patients will want to take advantage of some sort of sedation for this procedure, in addition to the local anesthetic that will be used. Prior to leaving our office, the patient is fitted with the prosthetic arch. After the implants have fully integrated with the bone, the patient may return to receive a second, stronger denture. In the days immediately following the All-on-4® placement procedure, patients should follow the detailed post-procedure instructions. Patients who are missing all the teeth within an arch or those whose teeth are failing. Patients who want to shorten the treatment time when compared with traditional dental implants, such as mini implants. If you or a loved one are considering complete tooth replacement with dental implants, the best way to determine the precise treatment option for you is to seek consultation with one of AZPerio’s board-certified specialists. Bone grafting can restore damaged or frail bones that support your teeth, allowing them to function properly. The procedure may be required in addition to dental implants if a stronger foundation is needed, such as in cases of significant bone loss. Bone grafting is effective because the tissues that our bones are made of can completely regrow and restore the bone to its original, natural state. Bone used for the procedure is taken from the patient or from another source so that the patient’s bone accepts the new material while it is regenerating itself. As the patient’s bone regenerates, the grafting materials make way for the new piece. An important factor in the success of a dental implant is the quantity and quality of the bone where the implant is to be placed. The upper back jaw has traditionally been one of the most difficult areas to successfully place dental implants. If a patient has lost bone in that area due to periodontal disease or tooth loss, the patient may be left without enough bone to place implants. Sinus lift surgery can help correct this problem, raising the sinus floor and developing bone for the placement of dental implants. There are numerous techniques to achieve the lift based on the patient’s individual situation, and we can evaluate each case using a 3D scan. Sinus lift surgery has been proven to greatly increase a patient’s chances for successful dental implant outcomes. Research shows this safe, highly predictable procedure has no negative effects on the sinus, and patients typically experience minimal discomfort afterward. It can be completed using local anesthesia or sedation. When a tooth is missing for a period of time, the jawbone begins to recede, leaving an indentation where the bone and tooth would otherwise have filled that space. If the indentation is significant, it can also show on the outside of the face, giving the perception of a hollow or drawn-in appearance. A ridge augmentation can restore the natural shape of your jaw and gums, thereby restoring your teeth’s natural functions, such as chewing and speaking clearly. We use a local anesthetic and gently open the area to expose the bone. The space left by the receding bone is then augmented with bone or grafting material to build up the space. Then the gum is moved back into place and the area is given time to heal. Restoring the space in this manner, prior to a dental implant procedure, can help increase the new tooth’s function. I’VE READ THAT PATIENTS WITH ALL THEIR TEETH MISSING NEED 6–8 OR MORE IMPLANTS PER JAW. WHY DO YOU RECOMMEND ONLY 4 PER JAW? The evidence-based studies and clinical success with the All-on-4® treatment concept allow for the back two implants to be angled slightly, giving as much support as multiple implant placements. An implant-supported bridge sits comfortably on these four specifically placed implants and is just as effective as sitting on many more implants using a non-All-on-4® treatment concept technique. In addition, most dental clinicians do not have experience with the All-on-4® treatment concept protocol and continue to use as many implants per jaw as the bone will allow, adding to the cost factor, trauma factor and treatment time. IS THE ALL-ON-4® TREATMENT CONCEPT NEW OR EXPERIMENTAL? The All-on-4® treatment concept has been successfully performed in Europe for more than 15 years and in the United States since 2011. It seems new, because more and more patients are asking for this procedure by name, often after hearing rave reviews from someone they know, love and trust. In one day you will be walking out with a new smile and renewed quality of life. After sufficient healing of the bone (4 – 6 months), your final and permanent replacement will be prepared and attached to your implants, providing a lifetime of smiles. As with all surgical procedures, the level of discomfort is patient-specific. AZPerio also offers a range of sedation dentistry options for patients apprehensive about the treatment. We will provide you exceptional care during your visit and the days following your procedure. Many implant patients comment on how surprised they were with the minimal discomfort they felt during the procedure. Most of our patients return to most to work within days of the procedure; many return the next day. There will be some swelling, but for the most part, post-procedure discomfort can be controlled with ice and over the counter pain relievers. HOW DOES AN ALL-ON-4® TREATMENT CONCEPT OPTION DIFFER FROM DENTURES? A denture is a removable device that is controlled by the patient and needs to be removed for cleaning and maintenance. It sits on the gum line, or is supported by “prepared natural teeth”, normally natural teeth that can no longer function as nature intended. In the case of a partial denture, it is attached using metal hooks to adjacent teeth – further leading to failure as it grinds against natural dentition and the gum line. Patients who are missing most or all of their natural teeth and are wearing dentures know the pain and discomfort brought on by these appliances, and most seek alternative treatment. In addition, dentures do not replace the tooth root, which in turn will cause the jaw bone to melt away due to lack of stimulation, causing even more pain and embarrassment for denture wearers. 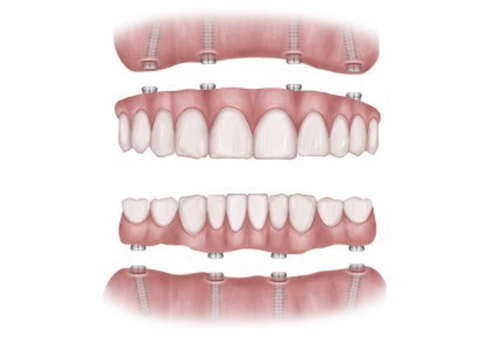 There is no irritation with implant-supported bridges. The new teeth are supported by the implants and not the gum, allowing freedom from the distress dentures caused, and the unsightly metal from partial denture wearers. Also, because there won’t be any devices covering your palate, you will be able to enjoy the taste of all the foods you’ve been missing, and you won’t need any dental adhesives to hold your new teeth in place. WHICH GENERAL DENTISTRY PRACTICES RECOMMEND THE ALL-ON-4® TREATMENT CONCEPT PROCEDURE? AZPerio collaborates with many general dentistry practices in the communities we serve to provide their patients with the quality of life benefits of dental implants and the All-on-4® treatment concept. These dentists and dental hygienists have observed the results AZPerio achieved for their patients and believe in the functional and lifestyle benefits of the All-on-4® treatment concept. They also realize the benefits of referring their patients to board-certified specialists with the advanced training, experience and technology to ensure optimal results. AZPerio has a compassionate team ready to assist you throughout your experience with our practice. AZPerio employs the latest dentistry technologies to help improve the patient experience and outcomes. Cone Beam Tomography/3D X-rays are used to assess the viability of certain procedures. Compared to traditional X-rays, this technology provides more detailed imaging, lowers radiation and saves time. Piezoelectric bone surgery refers to an ultrasound technology that provides surgeons with a better tool to achieve their desired result, allowing for sharp and clean cuts to tissues that result in less bleeding and faster healing time.